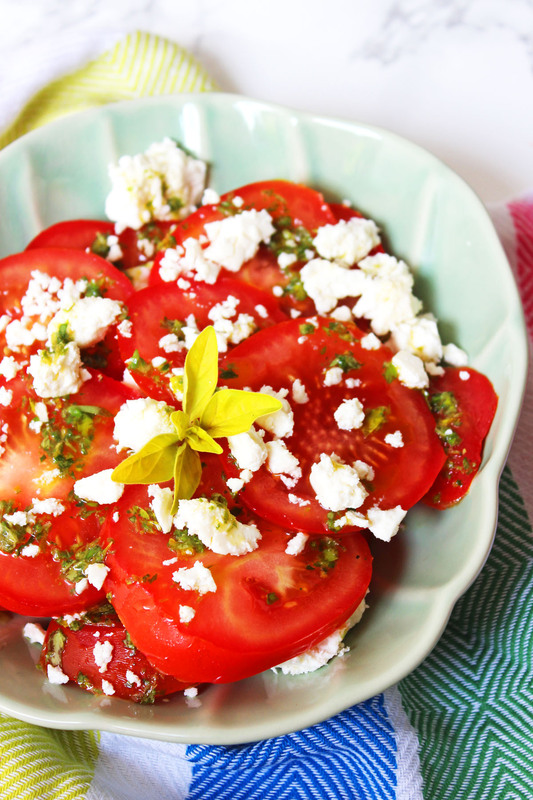 This delicious Tomato, Feta and Oregano Salad is the perfect side dish for summer. Why not pack it for a picnic, or serve at your next BBQ. It feels like such a long time since I’ve had a proper summer holiday abroad. For the last couple of years our trips away have been to rather cold places. It was China this year and Iceland the year before that. We’ve also had a few staycations in Cornwall which have, of course, involved a fair amount of rain. I miss taking a week off over summer and heading to a little Greek Island to bask in the sun. If I’m not going to head off to Greece any time soon then I need to bring a taste of Greece to me! I’ve been trying to master Souvlaki and Saganaki. But while those recipes are still in development, this Tomato, Feta and Oregano Salad will have to satisfy my cravings. My herb garden is going absolutely CRAZY. Despite keeping our herbs in small pots in an attempt to contain them, some are getting unwieldy! You can read about my herb garden here. The oregano in particular has done really well. We just can’t use it quick enough so I’ve had to resort to ways of “preserving” it so we can get some joy out of it for a little bit longer. You can of course dry and freeze herbs like oregano but with BBQ season in full swing I wanted to do something a little bit different. This Oregano Oil can be poured on almost anything (fish, chicken, halloumi, you name it) but I love it drizzled all over this Greek inspired Tomato, Feta and Oregano Salad. The first time I made this salad this summer was for a BBQ as friends. It’s a fantastic BBQ side dish whether you’re serving up traditional pork souvlaki, lamb steaks, beef burgers or even chicken drumsticks or a fillet of fish. It’s also a good salad to take on a picnic. Tomatoes always taste best when they’ve been able to warm up a little in the sunshine and you don’t have to worry about the oil making any salad leaves soggy – because there aren’t any! 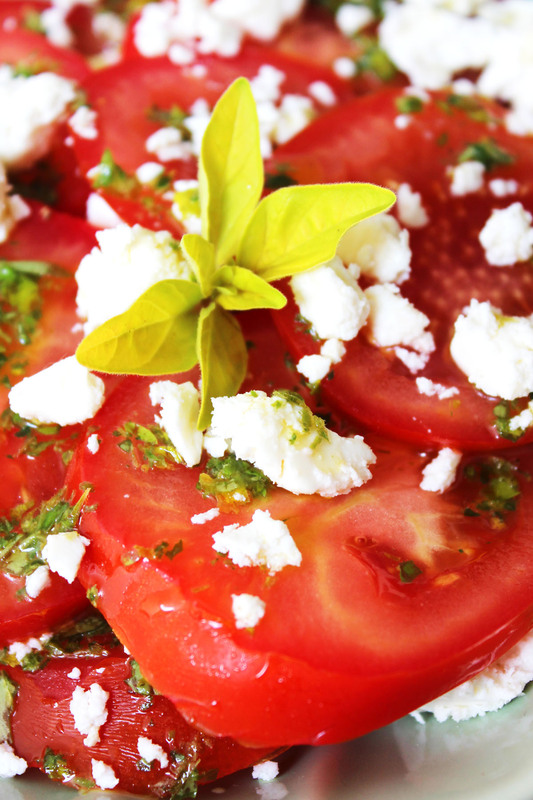 This Tomato, Feta and Oregano Salad really should be your go to summer side! You can use any old tomatoes for this recipe, colourful heritage tomatoes will make for a stunning dish but I prefer hearty beef mushrooms. Make sure you pick a real salty feta too. “Greek salad cheese” just won’t cut it here I’m afraid. Last but not least, make sure you’ve made a fresh batch of this Oregano Oil to drizzle over. Thinly slice a red onion and soak the rings in hot water for 5 minutes. Let the red onions cool down before adding to a shallow dish. Thinly slice the beef tomato and layer on top of the red onions. Sprinkle feta between the layers. Finally, drizzle over the oregano oil. Heading off on holiday? Lucky you! Make sure you’ve saved this delicious Greek inspired salad to make when you get back. This is just the most perfect plate of summer food, exactly my kind of meal! This is such a wonderful summery dish! I only really enjoy tomatoes during the summer! These are my favorite flavors all year round. Of course the summer is the best. Yum! I adore anything with feta, and since it’s late-summer tomato season, this recipe looks divine. Can’t wait to make it for an easy, healthy dinner! Now this is my kind of salad! Throw some chopped basil on there too. Great idea. The more herbs the better. Would this recipe work with either cherry or grape tomatoes? I have a produce drawer full of them. Hi Katherine it certainly would. Enjoy! This salad looks so tasty. Perfect for summer! Oh, I know. Especially after having kids and not having the freedom to travel when you feel like it is quite frustrating. So! Let’s bring the rest of the world’s food to our kitchen, shall we? I daresay, sometimes the food we prepare end up being better than what we would have had out there! Such an awesome summer salad recipe, Emma! Is this salad a common dish in the Greek cuisine? The ingredients are my all time favourites, so this salad is a winner for me! Woohoo glad you like it Eva. Glad you’ve enjoyed it Rachel! I love this type of salad and I make it very often in the hot summer days. There’s nothing better than the juicy sweet taste of the tomatoes combined with the tangy flavour of the feta cheese. The salad looks yummy. I would love to make mine.